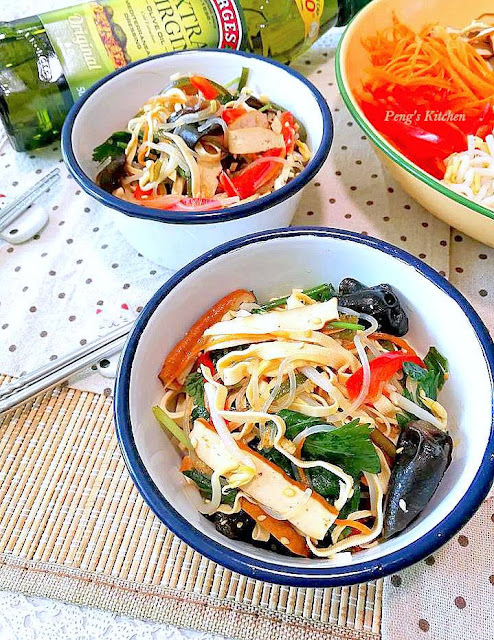 This is healthy wholesome Chinese style salad consisted for beancurd stripes, fresh kelp, carrots, beansprout, black fungus, bean vermicelli, bell pepper and celery. The salad dressing is a typical Chinese blend like dark vinegar, sesame oil, soy sauce, chilli oil etc. I've added tbsp of Borges extra virgin olive oil which blends well into this salad dressing and adding extra nutritional value into this tofu salad. 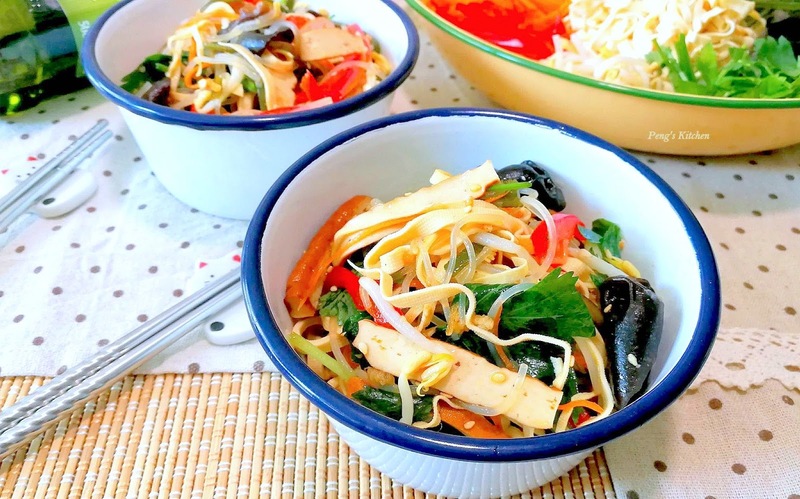 A great tasty tofu salad which can be served as a main dish! 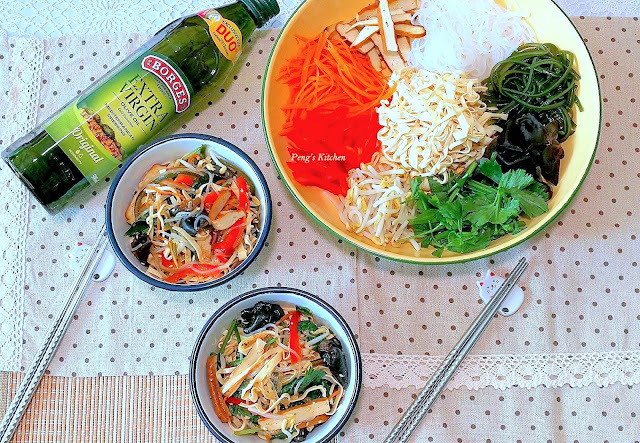 I had a huge serving as lunch but I serve it as a light afternoon snack for my kids. 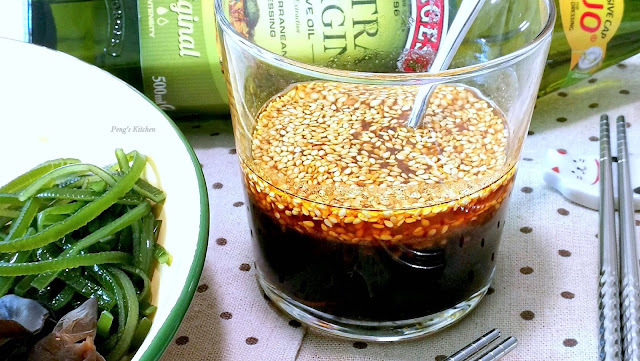 A very versatile salad dressing which you can adjust the taste as your liking. If you do not like it spicy, just omit the chilli oil. Prefer it to be more tangy or sweet, add more dark vinegar and sugar. But the overall taste still must be well balanced with right amount of sourness, savoury and spiciness. Rinse fresh kelp thoroughly to remove excess salt. Soak in water for at least 30 mins. Bring a medium pot of water to boil. 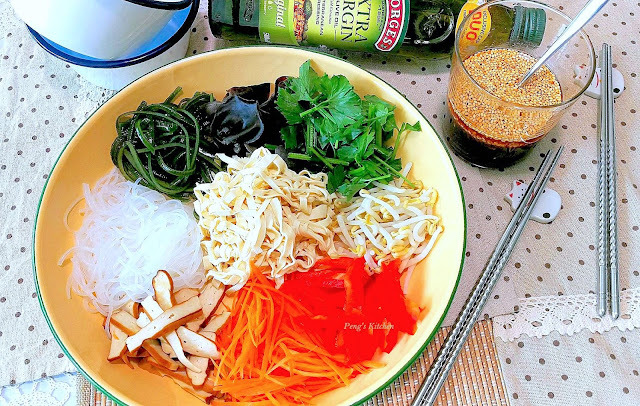 Blanch shredded beancurd, five spiced beancurd, beansprout, vermicelli, black fungus and kelp individually. Drain well each item and place them into a large mixing bowl. Add in carrots, capsicum and Chinese celery into the mixing. Combine all the sauce ingredient and whisk well. Drizzle the dressing over beancurd mixture. Toss gently and thoroughly to ensure that all vegetables and tofu are well coated with the sauce. Serve chilled or at room temperature.